If you’re heading to ALA Annual next week, and you don’t mind braving the heat, New Orleans is a wonderful city for arts and culture. 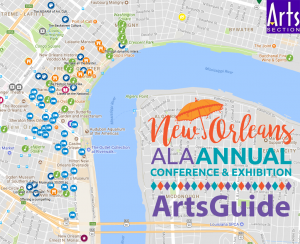 Check out the New Orleans ArtsGuide, created by the ACRL Arts Section for information about art, museums, music, and more. The map also includes the conference location and hotels for easy navigation. If you happen to take pictures while you’re visiting any of these venues, feel free to post them on the ACRL Arts Facebook page, or on Twitter using the hashtag #ArtsSection.